As a teenager, Edwin Meredith worked for his grandfather’s newspaper, “The Farmers Tribune.” It was heavily in debt and the grandfather gave young Meredith controlling interest in the publication as a wedding gift, which he turned around and sold for a profit. With the proceeds, in 1902, at the age of 25, he started E. T. Meredith Publishing Company with his own publication, the “Successful Farming” magazine. Meredith Publishing Company became a publishing empire including such magazines as Better Homes and Gardens,” “Ladies Home Journal,” “Country Life,” “Family Circle” and “Parents,” plus owning a string of both radio and television stations across America. E. N. Hopkins joined Successful Farming magazine in 1916. Already a committed enthusiast for boys and girls club work, by 1917 Hopkins had inspired E. T. Meredith to offer a $250,000 loan fund [value of over $5 million in 2015] to farm youngsters to start a business for themselves. Over the years, Meredith made over 10,000 loans to club members so they could buy purebred livestock or hybrid seed corn or any number of other farm and home project requests, pledging only their character as collateral. These low rate loans for $10, $20 or $50 were almost always paid off by the due date, if not before. The loans were always made directly to the boy or girl, not to their parents, and were officially set up as a contract between the youth and Mr. Meredith. The hundreds of stories and testimonials Mr. Meredith received from the loan recipients made him a strong supporter of boys and girls club work and its potential. Additionally, it brought the parents “on board” and served as an example picked up by hundreds of local bankers and other businessmen across the country who also started making loans directly to 4-H members. The subscription publication was billed as the only paper published exclusively for farm boys and girls. The publication carried many local news stories, excellent features, and hundreds of testimonials from the young Meredith loan recipients, or from their parents, letting Mr. Meredith know what a value the loan had meant. It is believed that the September 1922 issue may have been the last one published. However, if it had not been for these issues of the Meredith Publishing magazines, much of the history of 4-H for these years would, indeed, be unknown. 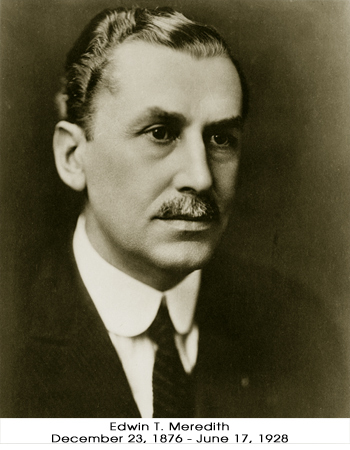 Edwin T. Meredith was always interested in politics, running for statewide office in Iowa twice. During the same period as the issuing of the “Farm Boys and Girls Leader” publication, in January of 1920, Meredith became President Woodrow Wilson’s Secretary of Agriculture. Edwin T. Meredith was a strong supporter for the creation of the National Committee on Boys and Girls Club Work to help supplement public dollars for Extension with funding and programs from businessmen in the private sector. He served as the first president of the National Committee on Boys and Girls Club Work, predecessor to National 4-H Council, from 1921-1924. Meredith continued to serve as a member of the National Committee on Boys and Girls Club Work until 1927. Early in 1924 Meredith allowed his name to be put forward as Iowa’s favorite son at the Democratic Convention. Early in 1928, he was considered as a Democratic nominee for President, however his health began to fail and he died that same year, at his home on June 17 at the age of 51. Edwin T. Meredith, with support from staff member E. N. Hopkins, provided the young 4-H movement tremendous visibility over a relatively short period of time, and opened up doors for other support that otherwise may never had been opened. Between the Meredith loan fund and the creation of the first national publication for rural boys and girls club work, plus being Secretary of Agriculture and the first president of the National Committee on Boys and Girls Club Work, he brought public relations and visibility of 4-H to a whole new level. The Meredith Foundation and the Meredith family continue support of 4-H today at state and national levels. This entry was posted in History and tagged 4-H History, E. T. Meredith by Larry Krug. Bookmark the permalink.